When Eliza Hart, the most popular girl at Ventana Ranch boarding school, is found dead on the cliffs outside her dormitory, Ellie Sokoloff is determined to figure out what happened to her. After all, Eliza was Ellie’s childhood best friend. New York Times bestselling author Alyssa Sheinmel delivers a gripping mystery and a sensitive and moving examination of the secrets that can hold us back—and even destroy us. I always hoped my career would center around books—whether editing or marketing them or writing them myself. I was that kid who kept notebooks full of stories, whose favorite subject was creative writing, who re-read her favorite books over and over again (something I still do), who took every writing class her college offered and every literature class she could. Before I began writing full-time, I worked in publishing—first as an editorial assistant and then in the marketing department at Random House Children’s Books. There’s really no hard and fast rule for me—for my last few books, I wrote the first few chapters without an outline and after a while, I realized I needed to stop and work out where the story was going. Once I have an outline written, I aim for writing a chapter a day—but I don’t even count those chapters as a first draft until I’ve gone over them and over them. Plus, there are stops and starts if I’m also working on other projects along the way, which I usually am. Then I get reads from others—my writing group, my agent, my editor, sometimes a friend or two—and gets notes from them. It’s honestly different every time. I have to admit, I find myself revisiting some of the same themes again and again in my different books—characters who feel just a bit (if not a lot!) out of place, friendships, self-acceptance. I don’t think I consciously choose to keep writing about these themes—but the stories I come up with inevitably touch on them. I’m generally a morning-writer—I get most of my writing done between nine and noon. When my first few books were published, I was still working full-time in the marketing department at Random House Children’s Books. (A job I loved!) At the time, I fit writing in on evenings and weekends and vacation days. Today, I’m lucky enough to get to write full-time, but I structure my days as if I still have an office job—I try to be sitting at my desk by about nine in the morning, and I work until it’s time for my lunch break, and then get back to my desk in the afternoon. Oh, this is such a hard question—if only I knew the answer! I honestly don’t know—for me, I just love my characters, and I keep writing until I see their stories through. I honestly think every book I’ve written comes with a new set of challenges. With R.I.P. 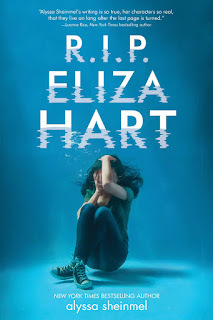 Eliza Hart in particular—as I wrote, it got more and more difficult to write Eliza’s chapters. How could I convey her hopelessness without actually conveying hopelessness? I just wanted to tell Ellie and Eliza’s stories in the way that felt the most true. Including R.I.P. 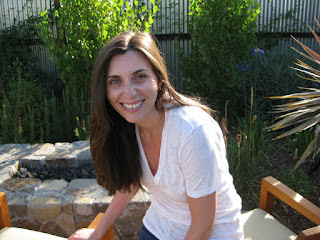 Eliza Hart, I’ve written six books, and co-authored two more. Honestly, my favorite is whichever one I’m currently working on—so at the moment, one that is far from finished (and might never be!). Maisie, the main character in Faceless, definitely has a special place in my heart. And I really love Eliza, the title character of R.I.P. Eliza Hart. And I love Sam, Ellie’s roommate in R.I.P. Eliza Hart. And Serena, Maisie’s best friend in Faceless. Okay, so I guess this is a long way of saying that I can’t pick one favorite character! I’m so dull—I just write at my desk every day. I took a very traditional route—I wrote a draft, queried agents, signed with an agent, who then took my book out to editors. By the time I had a draft ready to go on submission, I’d worked in publishing for a few years, not just in the marketing department at Random House Children’s Books, but also as an editorial assistant at a literary agency before that. I think because I’d worked in the industry, I wanted to go about getting published in the most traditional way. I think my mom and sister have most of my books, and I know my dad read Faceless. Does reading count? Well, in addition to reading and writing, I love anything that allows me to spend time with my dog, plus hiking, yoga, and cooking. Read. I know it’s not the most original piece of advice but I truly believe that everything I’ve ever read—every novel, essay, article, textbook—has taught me something about how to tell a story. There are so many authors who inspire me to write! Joan Didion, Alice Hoffman, Ann Patchett, Rainbow Rowell, Jandy Nelson, Markus Zusak....I really meant it when I said that I believe that I learn something about how to tell a story from everything I read. These writers (and many, many others) inspire me too try to do better work because they’re doing better work—they have skills that I don’t and tell stories that I couldn’t. And that pushes me to try to do better. I’m lucky enough to have a wonderful writing group—we meet about every other week, and we discuss everything going on with our work. Sometimes we brainstorm ideas together, sometimes we share excerpts from what we’re working on, and sometimes we just update each other with where we are on our works-in-progress. I’m so grateful to have a group of writers to talk to! Whenever I’m not on deadline, I’m usually working on a couple of new ideas at once, trying to figure out if any of them will turn into a novel. When I’m on deadline, I try to just work on one thing at a time. 19. If you could travel anywhere in the world to visit a place so you could use it as a background for a book, where would it be? Actually, I’ve already set a story in my very favorite place—R.I.P. Eliza Hart is set in Big Sur, California. But I’d love to (and I plan to) write more stories that take place there—and not only because it would give me an excuse to visit again for research! I really think it’s such a magical, atmospheric setting. I was born in Stanford, California, and even though I moved across the country to New York when I was six years old, I still think of myself as a California girl. Like so many writers, I grew up loving books. I loved stories so much that when there was nothing to read, I wrote my own stories just to give myself something to read. And when there was no pen and paper to be had, I made up stories and acted them out by myself. I played all the parts, and I was never bored.